Our knowledge of what G-d did for us - and continues to do for us - is extremely crucial to our lives as Torah Jews. Very hard to choose a single topic from a sedra like B'shalach. Let's try this one. VIDATEM And you will know that it was I Who took you out of Egypt. This is not counted separately as its own Term of Redemption; it is part of the pasuk with V'LAKACHTI & V'HAYITI, I will take you to Me as a Nation and I will be your G-d. But it deserves its own focus. Our knowing that it was G-d who took us out of Egypt is obviously very important for us. If we only heard the first two p'sukim of the Aseret HaDibrot directly from G-d (rather than via Moshe), then this was the first thing that G-d said directly to us. But from the perspective of the opening words of this week's sedra, one might not think so. Really? Par'o let the people go? It seems that Par'o thought that. Maybe that empowered him to change his mind and bring them back. Just in case Par'o and any of his people - or any of our people - thought that Par'o actually sent the people out, G-d's plan - so to speak - was to make it crystal clear who took the People of Israel out of Mitzrayim. 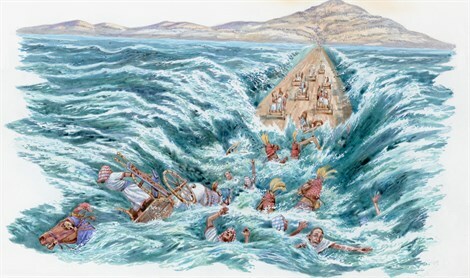 And, sure enough, when the sea split and we had dry land for our passage through it, and the Egyptian chariots lost their wheels and got bogged down in the seabed (which miraculously was dry land and easy going for us, and then the sea closed drowning the Egyptian army 'horse and rider', that's when the Torah says that the people (finally) absolutely believed in G-d and in His servant Moshe. But VIDATEM does not end at the other side of the sea. HaShem 'introduced' Himself to the people as the One Who took them out of Mitzrayim. And we not only hear those words on the three times a year that the Aseret HaDibrot are part of the Torah reading, we recite a different pasuk twice a day - as part of the mitzva of SH'MA. It's the last pasuk of Sh'ma and it constitutes a fulfillment of the command to remem- ber the day we left Egypt - all the days of our lives. "I am Hashem your God, who brought you out of the land of Egypt, to be your God: I am Hashem your God." In the wording of this pasuk, we can see the connection of V'HAYITI and VIDATEM. Our knowledge of what G-d did for us - and continues to do for us - is extremely crucial to our lives as Torah Jews. Let's end by quoting another pasuk that takes ANI HASHEM ELOKEICHEM to a no-less-important next step: (Vayikra 25:38) I am Hashem your God, who brought you forth out of the land of Egypt, to give you the land of Canaan, and to be your God.